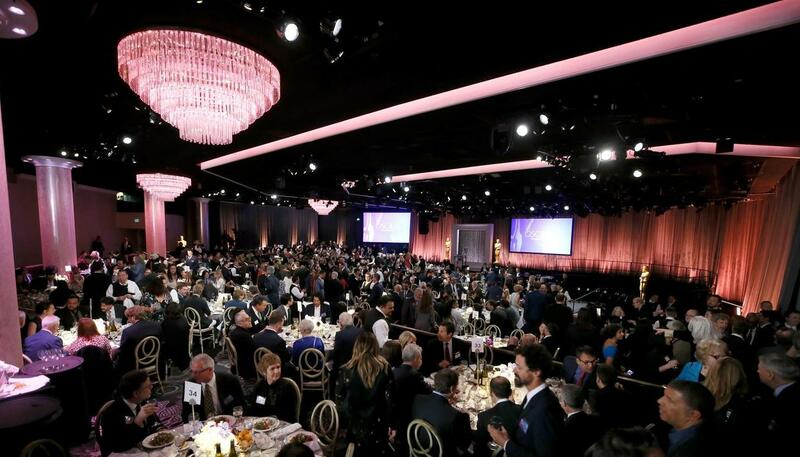 Nominees for the 91st annual Academy Awards convened at the Beverly Hilton Hotel on Monday, February 4 for this year’s Oscar Nominees Luncheon, a gathering that gives honorees a chance to socialize at an event where everyone’s name will be called and they’ll get a moment onstage. That moment is for the “class photo,” but the day is so much more. For some nominees, it’s the first time they’ll meet someone whose work they cherish. Many will do interviews where they can reflect on their films, and look ahead to the Feb. 24 and what they’ll wear and who they’ll thank. Grant is nominated for best-supporting actor for “Can You Ever Forgive Me?”, which is his first nomination. He says Steve Martin, with whom he co-starred in “L.A. Story,” emailed him Sunday: “Congratulations on your overnight success.” Grant cackled with laughter recounting the message. How early is too early for a cocktail? “Spider-Man: Into the Spider-Verse” writer and producer Phil Lord found himself among the early arrivals to the annual Academy Awards Nominees Luncheon contemplating that very question. With few around to talk to yet, a companion told Lord that she was headed to the bar. While the passed champagne and wine may have sat out for a bit when the doors to the Beverly Hilton Ballroom opened at 11, by noon, the nominees and guests were ready to toast. Lord eventually found some fellow early birds to socialize with, by the way, in “Free Solo” climber Alex Honnold and best actress nominee Glenn Close. It’s the day after the Super Bowl and Regina King walks through a restaurant at the Beverly Hilton Hotel when she spots a fan in a New England Patriots jersey. “Congratulations,” the effervescent best supporting actress nominee shouts to the man, in a less than enthusiastic tone. If there are any hard feelings about the Patriots winning the Super Bowl, King certainly doesn’t have them for the man wearing the Tedy Bruschi jersey. She stops and shoots a selfie with the man and his companion before heading off to do interviews. Barry Jenkins chose his Oscar luncheon attire carefully, pairing a dark suit with bees stitched on it with a burgundy tie. Spike Lee says 2019 is an appropriate year for him to score his first best director and best picture Oscar nominations. Lee cited two historic events that make it a meaningful year for him to get recognized for “BlacKkKlansman” — the 30th anniversary of the release of his breakthrough film “Do the Right Thing.” In addition to that, Lee said it was the 400th anniversary of his ancestors being brought as slaves to Jamestown, Virginia. Lee, who was awarded an honorary Oscar in 2015, rocked a pair of custom gold Air Jordan sneakers to the luncheon. On the left foot is written “BlacKkKlansman’s” title and “Speak On It” written on the right.